Thanks Charles for reminding me of one of the greatest busts in sports history. Mr. 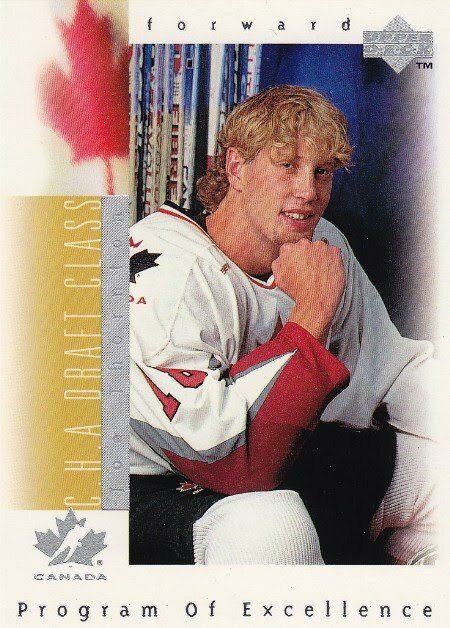 Leaf was one of the original members of my Sports Bust PC. If you need a little refresher course, I encourage you to head over to Charles' blog: Hoopography. He recently posted an excellent write up on Mr. Leaf and included a very interesting video. Anyways I recently pulled a super shoebox full of 90's rookies out of storage (my buddy's garage). And as luck would have it... I had a small stack of Mr. Leaf's rookies. This was actually a pleasant surprise, because I thought I sold most of these a long time ago, when I took a break from collecting in the early 2000's. So... if anyone out there is interested in a beautiful card lot featuring the biggest draft bust in NFL history, let me know. Maybe we can work something out. Okay... seriously... nobody wants to give up anything for this garbage... but I am willing to give this garbage away for free. All you need to do is complete a trade with me and I'll throw in some of this trash. After that... it's up to you to decide what you want to do with them: burn them, eat them, bend them, treasure them, or pass the trash to another collector. So if any bloggers out there are interested in trading... PM me. Here's links to my tradelists and my bucket... hopefully we can work something out. By the way... 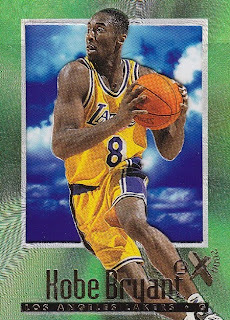 I'm on Sports Card Forum and Card Collector's World. If you are too, we can create trade agreements over there and leave each other positive feedback. So today's question of the day is... How many card trades have you made with other bloggers? What are some of your favorite bloggers to make trades with? So far I've made only one blog trade... and it was with Shot Not Taken last month. However, I just worked out a deal with Spankee over at My Cardboard Mistress. I hope everyone has a great weekend. 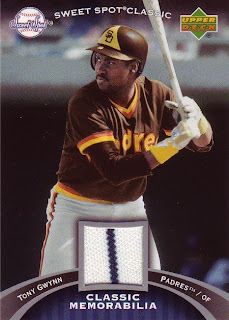 And Charles...I'll make sure to post another Sports Card Bust in the next week or so... and Spankee... your cards are packaged and will be shipped out today (sorry... I didn't throw in any Leafs... but there's a bonus in there for you). I apologize in advance for the TRIFECTA overload... I wasn't planning on posting another sports card trifecta until next week... but then every once in awhile... the stars are aligned and someone deserves some serious recognition. Last night was a good night for Bay Area sports fans. Obviously most of the country observed the Giants take the first game in the World Series. If you're a basketball fan... then you can appreciate Monta Ellis going off for 46 points (on 75% shooting), as the Warriors knocked off the Rockets. However today's post isn't about the Giants or the Warriors. Sure I enjoy watching both of those teams, but they're not a priority in my life. Nope... when it comes to sports... the Sharks are #1 on my list. It's not because hockey is my favorite sport to watch on TV... sorry that's football. And it's not my favorite sport to play... I've never played ice hockey in my life (except for video games). It comes down to location. The Sharks are in San Jose... and this is where I was born and raised. So call it "hometown pride". Anyways... last night, the Sharks played the New Jersey Devils. Both teams have been disappointing to say the least... and both teams needed this win. Coming into the game, the Devils' only two wins had come on the road... while the Sharks hadn't won a game at home yet. So... I was crossing my fingers hoping that the Sharks would bump this trend. And... boy did they bump it. Actually... it was pretty much a three man show. Dany Heatley and Patrick Marleau each had a goal and 3 assists en route to a 5 to 2 win. On any other night, these stats would have earned them player of the game honors. However... when the team captain has a "hat trick" and throws in a couple of assists... it's hard not to choose him as the man of the hour. The Devils never found a way to contain Joe Thornton and his linemates. His play last night was a work of art... a masterpiece for San Jose Sharks fans. 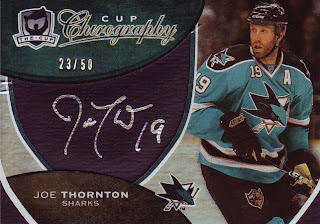 Well... today I'm returning the favor... by dedicating this blog post to Jumbo Joe. This is the only rookie card that I own of Joe (I really... really... really... want his Upper Deck Ice card... hopefully one day I'll pick it up. By far... the autograph card was my biggest dilemma, because I love my Sweet Shot autograph of him too. However the silver autograph on the black material stands out better, so this card got the nod. This is one of my favorite cards in my Sharks PC. 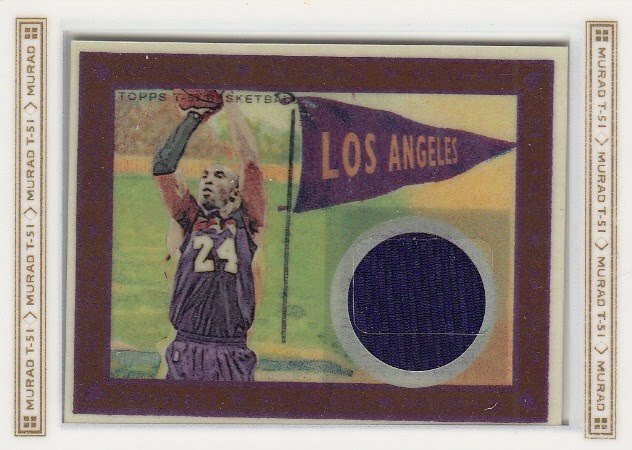 There's no patches... and it's not numbered. 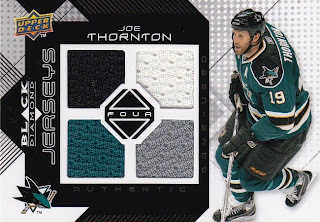 However... this card has four different colored swatches. The only color it's missing is orange... but I'm not complaining. What's your favorite sport to watch on television? What you're favorite sport to watch in person? Well... only two more days until the weekend. Enjoy the rest of your week! So it begins. Tonight the Lakers face the Rockets at Staples Center to kick off their season. It's their first step towards winning their third NBA championship in a row. If successful, it'll be Pau Gasol's first three-peat. For Kobe and Fish, it'll be their second. And as insane as this may sound... if the Lakers win it all this season... it'll be Phil Jackson's fourth three-peat... that's twelve NBA championships! If Coach Jackson has any chance of winning his twelfth ring... he'll need his players to play solid defense... he'll need his bench to bring energy in the second quarter... he'll need his big men to play tough... and he'll need his superstar... Mr. Bryant... to be a leader on the court. It's way too early to tell whether or not the Lakers will be able to win it all again. There's just too many factors... trades... injuries... chemistry. We can all make our educated guesses... but that's just it... they're guesses. Each year there's at least one team that takes the league by surprise. Just look at who's playing in the World Series. Anyways... my guess is that it'll be Boston and the Lakers again in the Finals... with the Celtics coming out on top... but only time will tell. Today's question of the day is... Who do you think is going to win it all this year? Will Kobe get his 6th ring to tie Jordan? Will Wade and his homies live up to everyone's expectations? Will Shaq be able to write another rap for Kobe? Will Durant show the world he's the best player in the league and bring a championship to OKC in only his fourth season? Only Nostradamus and the big man upstairs knows... everyone else step up to the line and take your best guess. Happy Tuesday... and Go Lakers! 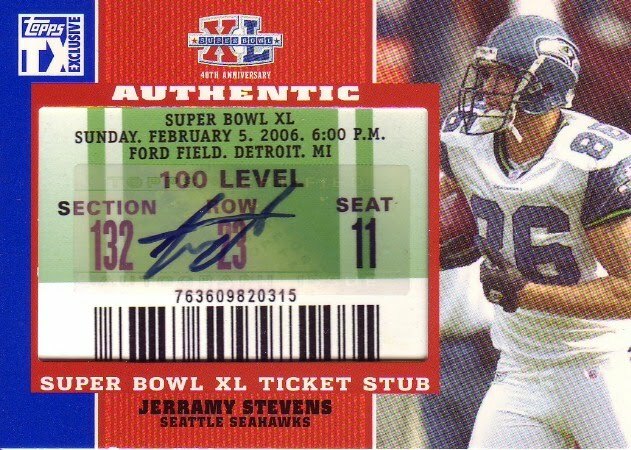 The Good: Mr. Stevens was drafted in the first round of the 2002 NFL Draft by one of my favorite teams... the Seattle Seahawks. In 2005, he had the second most receiving touchdowns on the Seahawks and was third on the team in receptions. 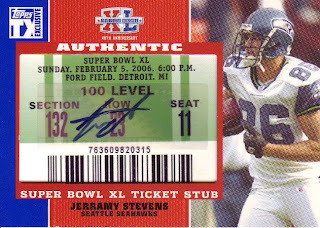 That same year, he helped the Seahawks reach the Super Bowl for the first (and only) time in team history. In fact, he's the only Seahawk to ever score a touchdown in a Super Bowl. The Bad: Mr. Stevens has had problems with the law for years, but his DUI arrest on March 13th, 2007 was the straw that broke the camel's back. The Seahawks released Mr. Stevens, allowing him to have a much needed change of scenery. Several weeks later he signed with the Tampa Bay Buccaneers. The Ugly: Since his signing with the Bucs, he has been suspended for multiple games for violating the NFL's substance abuse policy. Then two days ago, Mr. Stevens was pulled over by a police officer for playing his music too loud. After smelling marijuana, the officer searched Stevens' vehicle and found 38 grams of marijuana. He was arrested and charged with felony possession of cannabis and a misdemeanor of possession of drug paraphernalia. Just when things couldn't get worse, today the Buccaneers released him. Like I tell my students all the times... everyone makes mistakes. What's important is that you learn from them. Hopefully Mr. Stevens takes a few steps back, assesses his decisions in life, and makes some serious changes... because I don't see how it can get any uglier than it already is. Today's question of the day is: What's your favorite Western movie of all time? Happy Monday everyone... have a great week! I know what you're thinking... another acetate set? I just can't help myself. Here's another opportunity for collectors to go out and pick up a piece of art for a handful of change. Sure they're from the "overproduced, insert crazed 90's", but if you're a "collector" and not an "investor", like me... then it's our opportunity to seize the day. 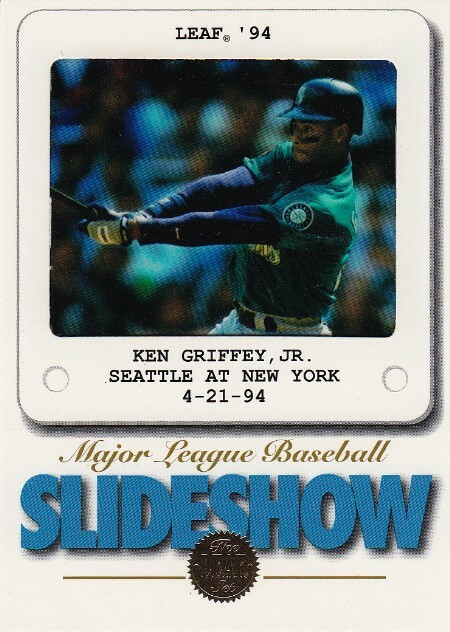 Sixteen years ago, Leaf inserted these "Slideshow" inserts into their baseball packs at a rate of one per fifty-four retail/hobby packs. You could also pull them from their jumbo and magazine packs too (1:36 packs). The card is based on photo slides and features an acetate photo, which is labeled with the specific date and game from which the photo was taken. On the flipside, there's a quote about the featured player from Frank Thomas. Straight to the point... they're simple, beautiful, cheap, and feature acetate. It doesn't get much better than that. 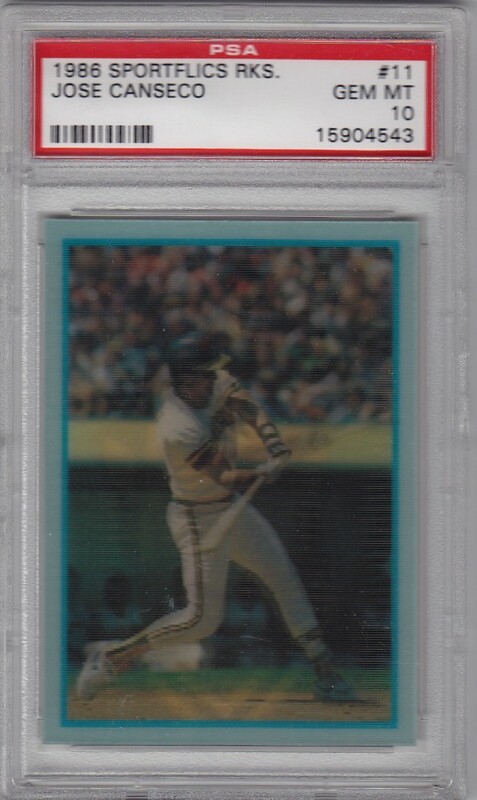 By the way... the scans don't do this card justice, since you need light to shine through the acetate to get the full effect. Card: 1994 Leaf Slideshow #9 Ken Griffey Jr. Your best bet is to go onto COMC and submit a best offer. I picked up both of these for a combined $2.74 and was pumped since there's a chance both of them will end up in the HOF one day. 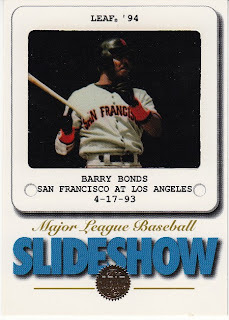 We all know that Griffey is a lock... but Bonds is another story. 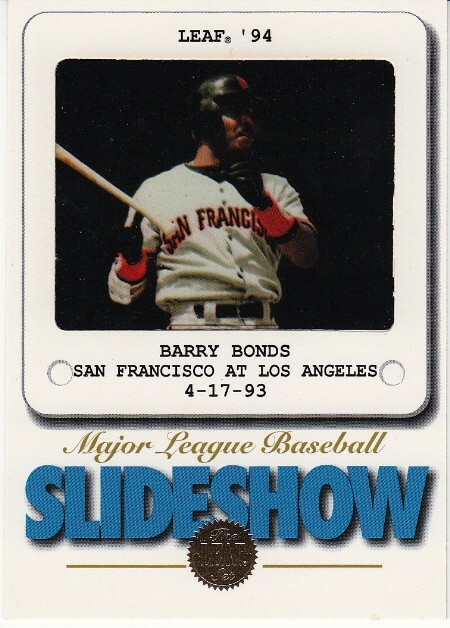 So today's question is: Do you think Barry Bonds will ever have a plaque hung up in Cooperstown? If so, when? 1st ballot? C'mon Charles... wha'cha think? It's week 7 and the Green Bay Packers are sitting in 2nd place in the NFC North with a 3-3 record. Part of me is disappointed that they're not in first place and have struggled the past few weeks. However, on the flipside... I understand that injuries are taking their toll on a very talented team. So to cheer myself up... 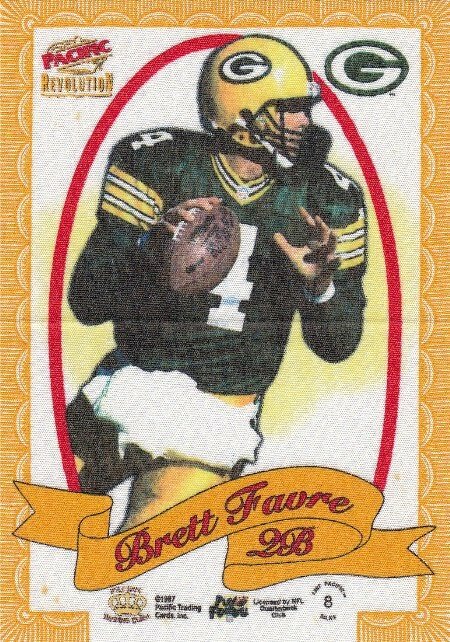 I decided to check out my five favorite Packers cards in my collection. Okay, so this isn't actually a picture of my card. A lot of my higher end cards are in a safe at my parents' house in Las Vegas, so I don't have access to this card right now. However, I can assure you that it's part of my PC and is my favorite for two reasons. 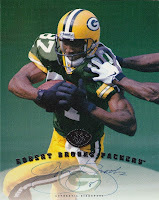 First, it's an on card autograph of my favorite Packer of all-time. And two... the card is made of acetate. The only problem with my card is that it's not nearly as clean as this particular scan. My autograph is a little faded compared to this one. 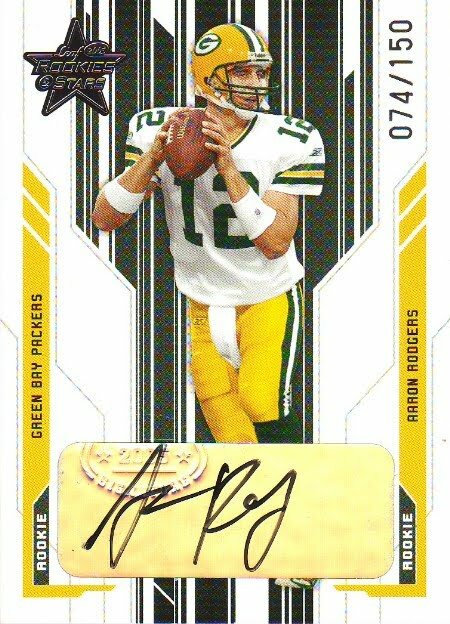 Aaron Rodgers is my favorite "current" Green Bay Packers player and unfortunately, I only own 2 of his certified autographs. This is my favorite of the two. It's a sticker autograph, which stinks... but the card itself features a cool design and shows him in his Packers uniform. I've been a fan of Rodgers since his playing days at CAL. Hopefully he can one day hold the Lombardi Trophy while wearing a Packer uniform. I graduated a long time ago from SJSU, so I get excited every time a Spartan gets drafted. It's even better when a Spartan gets drafted by my favorite team. 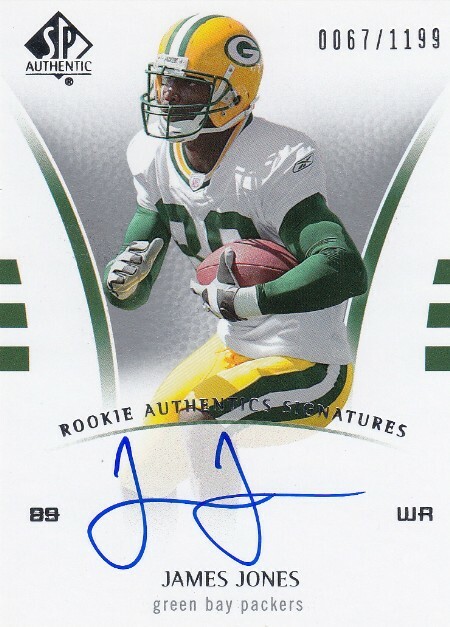 Which is why I'm always trying to add to my James Jones PC. He'll never be a top receiver, but that's fine with me. It keeps his cards affordable. This particular card features a simple design with an on-card autograph - two key elements to a beautiful card. 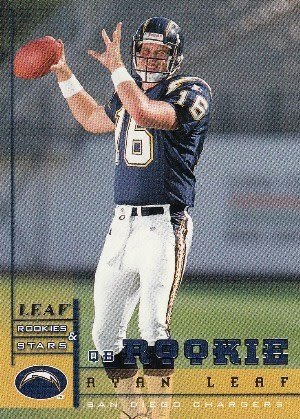 When I was growing up, Lynn Dickey was my favorite quarterback. Years before that... my father's favorite quarterback was another Packer legend: Bart Starr. I don't remember when I bought this poster, but it was probably in the early 80's or mid 80's. 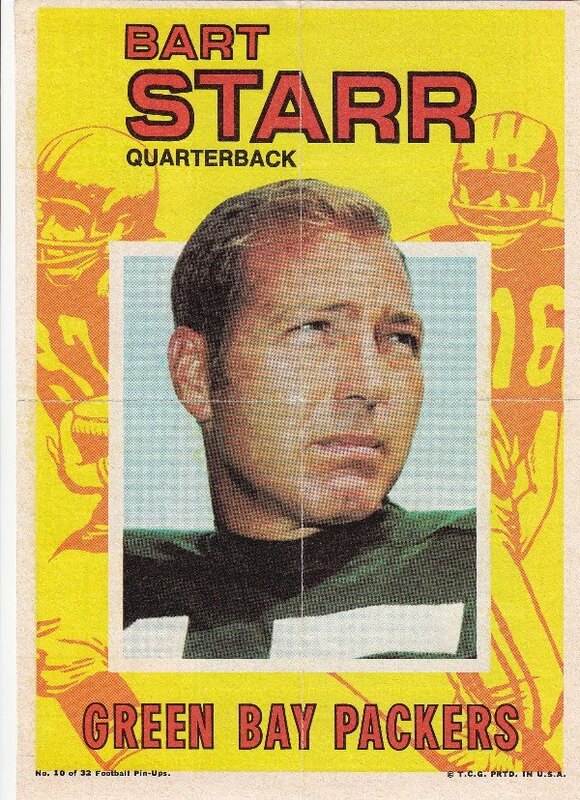 I picked it up at a card show, because I remember my father telling me stories about Mr. Starr. 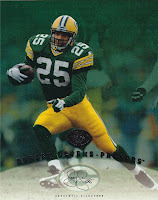 I could be mistaken, but I think it's the first piece of Packers memorabilia that I ever purchased. And I owe it to my dad. 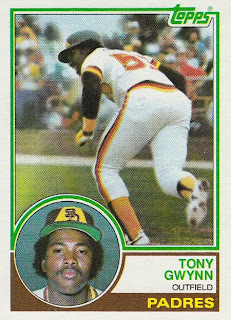 Rounding out my top 5 is another Bay Area legend. I've already featured a CAL Bear and a SJSU Spartan... so I guess I have to feature a Stanford Cardinal. 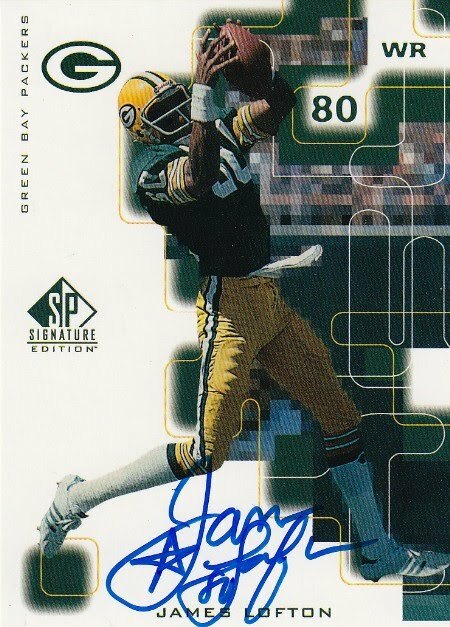 James Lofton is one of the greatest wide receivers to ever wear a Packers uniform. I chose this particular card because it features a stunning on-card autograph. I wish all athletes would take the time to sign like Mr. Lofton. Honorary Mention #1: My Sweet Spot "Helmet Autos"
I've always been a huge fan of these Sweet Spot autographs. Here are my three favorites. Adderly and Hornung are way before my time, but my father loved them... and that's good enough for me. On the other hand, Greg Jennings is one of the Packers top receivers right now and I've been a huge fan of his since they drafted him in 2006. 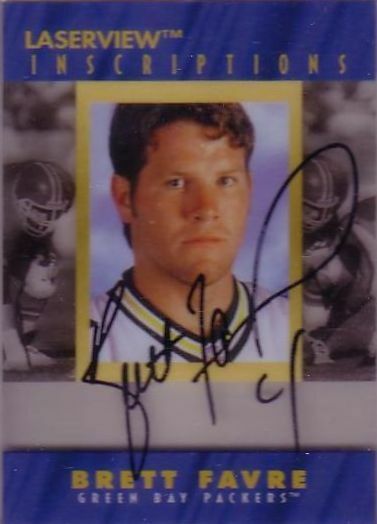 Honorary Mention #2: My 1997 Leaf Signature "Autographs"
The last time the Packers held the Lombardi Trophy was in 1996 when they beat the Patriots in Super Bowl XXXI. Three reasons they accomplished this feat were Levens, Brooks, and Freeman. 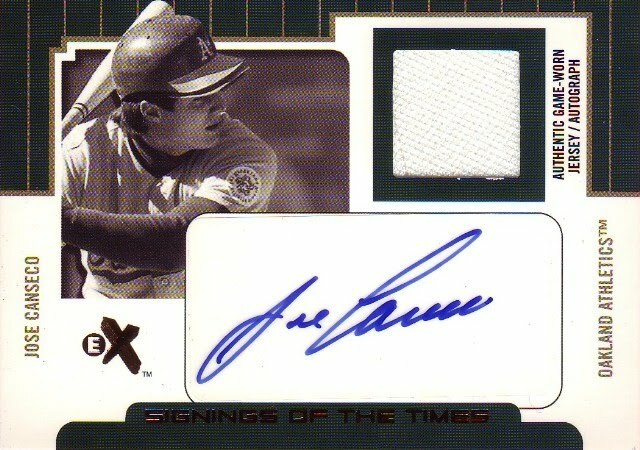 I've always been a fan of this product, because they feature on-card autographs. Unfortunately, they're not regular sized cards - they're 8 x 10. I've always considered framing these bad boys, but I don't want the autographs to fade (the Brooks is already difficult to see). Well... that's it. Those are the highlights from my Packers PC. Now onto more important things. At the start of the season, almost everyone had the Packers making the playoffs. Some of us even had them going to the Super Bowl. Today's question is... Do you think the Packers will still make the playoffs this year? Also... who do you think will win the NFC North? Just curious... I'll give you my answer after this weekend's game against the Vikings. Have a happy Friday! 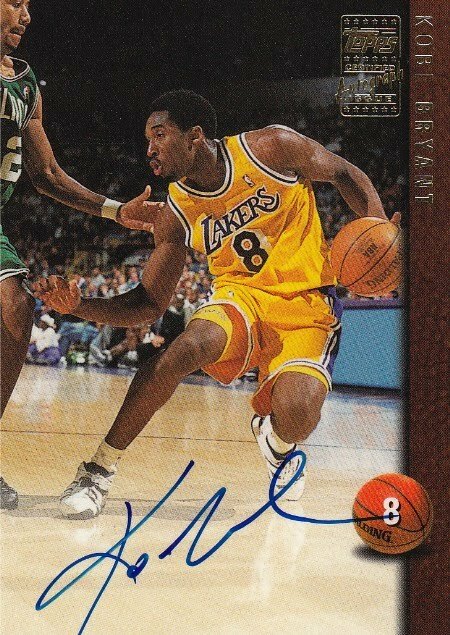 What is a sports card trifecta? 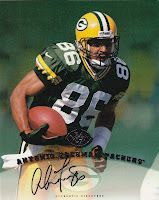 It's when you put together an athlete's rookie card, autograph, and memorabilia card. I came across this idea while reading Drews Cards: A Teenager's Journey Through The Card Collecting Universe. If you've never checked him out... I suggest you head over there and read his blog. He's got some interesting stuff. Now onto my first trifecta. I probably have a few "sports card trifectas" in my collection, but I chose to kick off this series with Tony Gwynn, because he's one of my favorite athletes of all-time. If you're interested in reading about my admiration for Gwynn, I wrote about it in a previous post. If you're interested in keeping track of my "sports card trifecta" collection, I'll be posting it on my website. Now that's SpastikMooss has answered my first question of the day... here's the updated question of the day: Do you have any "sports card trifectas"? Thank you SpastikMooss for helping me out... and Thank you Drew's Cards for coming up with this awesome collection. I hope everyone is enjoying their weekend. Have a great week! I love that you can pick up so many cool 90's inserts for the price of a sandwich at Subway. Sure there's nothing quite like a tasty Italian B.M.T. when you're hungry. However these silks are going to last a lot longer than 15 minutes. In fact, these silks are tiny pieces of artwork. The first one I pulled was actually out of hockey and it's still in my possession. I came across both of these when I searched the term "silk" on COMC. 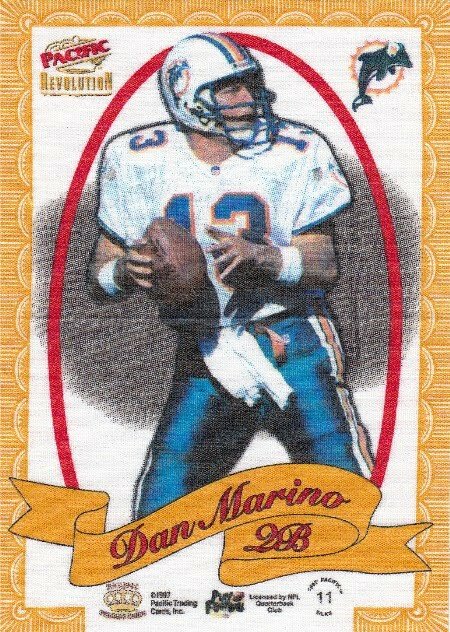 The Favre set me back $4 and the Marino cost me $2. 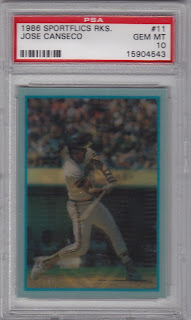 Kruk Cards has complete sets for sale on eBay for $49.99, but for that price I'll probably just build the set on my own. So tonight's question of the day is... What your favorite subway sandwich? 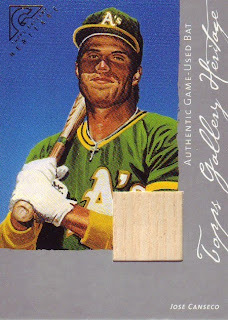 Love him... or hate him... Jose Canseco left his mark on our hobby. As a lifelong A's fan, I've been a fan since his 40/40 days during the late 80's. I'll be honest, I got rid of most of my collection when he was traded to the Rangers. But there's always been a part of me that's been a fan of his. I know a lot of people consider him to be a snitch... a sell-out... a cheater... and just about every other name in the book. But before any of this happened he was a hero to a lot of A's fans. Don't worry... I've learned from this mistake. I remind my students that athletes are entertainers... and parents are role models. So today, I'm not going to discuss his mistakes. Instead, I'm going to focus his accomplishments on the diamond. Canseco will probably never have a plaque in Cooperstown and rightfully so. However his stats and accomplishments as an Athletic are impressive nonetheless. In 1986, he won the American League ROY award. Two years later, he won the AL MVP award after leading the league in slugging percentage (.569), home runs (42) and RBI's (124). That year he also became the first major leaguer to hit 40 home runs and steal 40 bases in the same season. Then in 1989, he helped the A's win the World Series against the San Francisco Giants in the Battle of the Bay. He made the all-star team five times as an Athletic (6x in all) and was also the recipient of the Silver Slugger Award three times (4x in all). 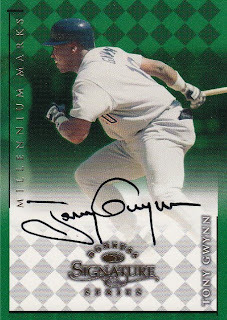 As an Athletic, he hit 254 home runs (4th all-time), 793 RBI's (6th all-time), and 1,096 strikeouts (2nd all-time). I know that many of you are saying to yourselves, "he only accomplished this because of PED's" and you're probably right. It's sad that so many players tarnished the game, but luckily some have been caught... and hopefully justice will prevail. Although... at this point... I'm not quite sure what that means. 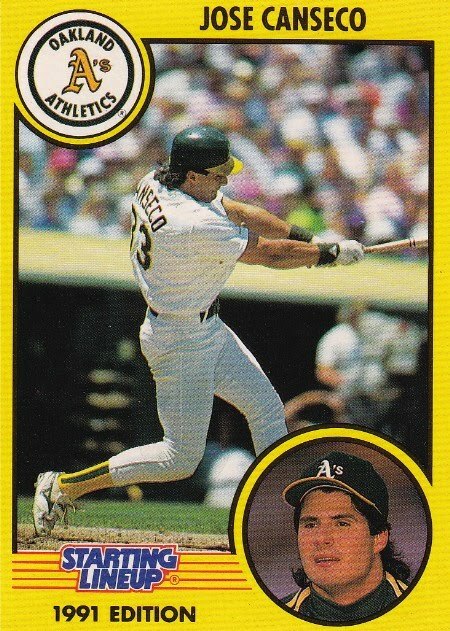 Anyways... this post isn't honoring Jose "the user" Canseco... it's honoring Jose "the Oakland Athletic" Canseco. Now it's time for today's question of the day: Have you ever stopped liking one of your favorite player's, because of an "on" or "off" the field decision they made? If so... who and why? If you look at my PC... "drama" and my "favorite players" seem to go hand in hand. Have a great week... Sayonara! I have a problem... and I need your help!